Early in the evening two young brothers and their mama finish supper in the sturdy red cabin and set out to fish. While digging for worms, rowing the boat and pulling in fish, each brother asks his mama which one is the best at each task and, as they are being tucked into bed, which one she loves the best. 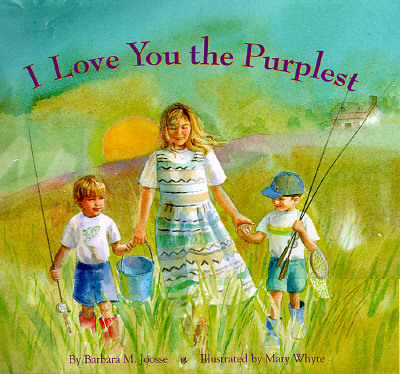 Barbara Joosse's heartwarming text is beautifully complimented by Mary Whyte's engaging watercolor illustrations. Readers will delight in the tender message that every child holds a special place in a parent's heart. Barbara Joosse is a full-time writer and mother. She lives with her family in a little stone house in Wisconsin. Ms. Joosse has a degree in journalism, but for the past 19 years she has devoted her time and talents to writing nearly twenty books for children. Visit Barbara Joosse's home page at: www.barbarajoosse.com. Mary Whyte is an accomplished artist best known for her watercolor paintings. She lives in South Carolina with her husband and their golden retriever. To children who ask "Who do you love best?" this book offers the perfect balm. The setting for eloquent text and watercolors is a day spent fishing--and competing to be number one. Each child, a mother tells her two sons, is beloved for his own special ualities. The deliberate Julian is loved "the bluest," ebullient Max "the reddest," for a combined love that is "the purplest." When two brothers ask their mother which one she loves best, she comes up with a wise and loving answer. This book is a tender reminder that have a special place in their parents' hearts. The setting is idyllic as two brothers and their Mama go fishing in the lake near their cabin until stars sprinkle the sky and the water turns dark as night. Max is boisterous; Julian is quieter and both of them are rivals for their mother's attention and her love. Who's the best fisherman? they ask Who's the best rower? At the end of the day, who does Mama love the best? Each time she answers them to show that she loves them both for their own special selves. Whyte's double-page-spread watercolors show the warm family scenes in a landscape filled with light and color. A soft affectionate story to confront the hard edges of sibling rivalry. --CHILD, Best Books of the Year, December/January 1997 To children who ask, "Who do you love the best?" this book offers the perfect balm. The setting for eloquent text and watercolors is a day spent fishing--and competing to be number one. Each child, a mother tells her two sons, is beloved for his own special qualitites. The deliberate Julian is loved "the bluest," ebullient Max "the reddest," for a combined love that is "the purplest."